Come learn about The Principles of Our World. In a series of real-life stories, readers will be introduced to The Principle of Hope. 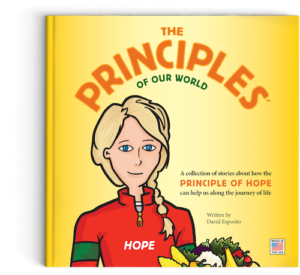 The stories in this children’s book are meant to remind all of us about the importance of hope in our lives. Enjoy the book in one sitting or read just one story at a time. “Hello, I am The Principle of Hope. “People say I am the reminder they need to keep believing in their dreams even when they are unsure of what tomorrow will bring. “People also say that I am the helpful hand that pulls them out of a struggle. “There will be times in your life when you struggle to accomplish your goals. I will help give you strength to believe in yourself, so you can keep making progress toward your goals. “My parents told me that when they were young and newly married, all they had was Hope; and that is why they named me Hope. “Please call on me when you need a ‘light’ to get through a dark struggle. I will help remind you that you can achieve your dreams no matter how difficult today may seem.